Steve and I were with his sister, Maureen, returning home from dinner with Maureen and Steve’s three other sisters, Diane, Sharon, and Janet, PLUS his mother, RoseAnn (his four brothers were not there), when I spied two bicycle wheels in the recycling bin of his mother’s neighbor. I expressed the temptation those wheels presented to me, for they were not only scrap metal, they were ROUND and full of art-potential. 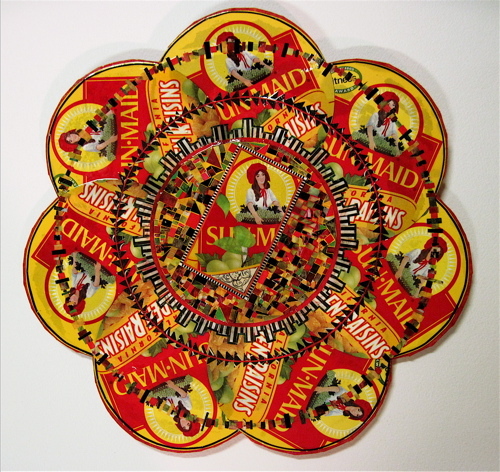 Then I dismissed the idea of salvaging the wheels because we were already transporting a van-load of art and paraphernalia necessary for my booth exhibit at the Flint Art Fair, which had just ended. “Someone will take them,” said Maureen, an observation that alternately comforted and disturbed me. Next morning at 7:00, as Steve and I pulled away from his mother’s home in Grand Blanc, Michigan, to head back to our home in Staunton, Virginia, I noted that those bicycle wheels were indeed gone from the neighbor’s bin. Feeling once again comforted and disturbed, I commented to Steve that Maureen had been right. Steve agreed that someone probably took them, and then we started talking about something else, or possibly about nothing else. Two hours later, however, as we approached Toledo, we were definitely talking about whether or not we should have taken Highway 23 or stayed on 23 or I-75 or whether it mattered, and more urgently, where we might find a bathroom, and after that, coffee. I didn’t want coffee myself, or even a bathroom, but Steve wanted both, and as it turned out, a classic McDonald’s breakfast, which he got for himself while I rearranged a few items in the van so they would not slide around every time Steve changed lanes. But we didn’t get gas in Toledo. Rather, Steve fulfilled his hidden agenda of hashbrowns and an Egg McMuffin or some food like that. When he came back to the van (a black Honda Odyssey, just so you can visualize it) he and I went to the rear compartment for water. When Steve opened the tailgate, I burst out laughing. There were the bicycle wheels, which he had purloined the night before while taking out the trash. “You little sneak!” I said. Or something like that. 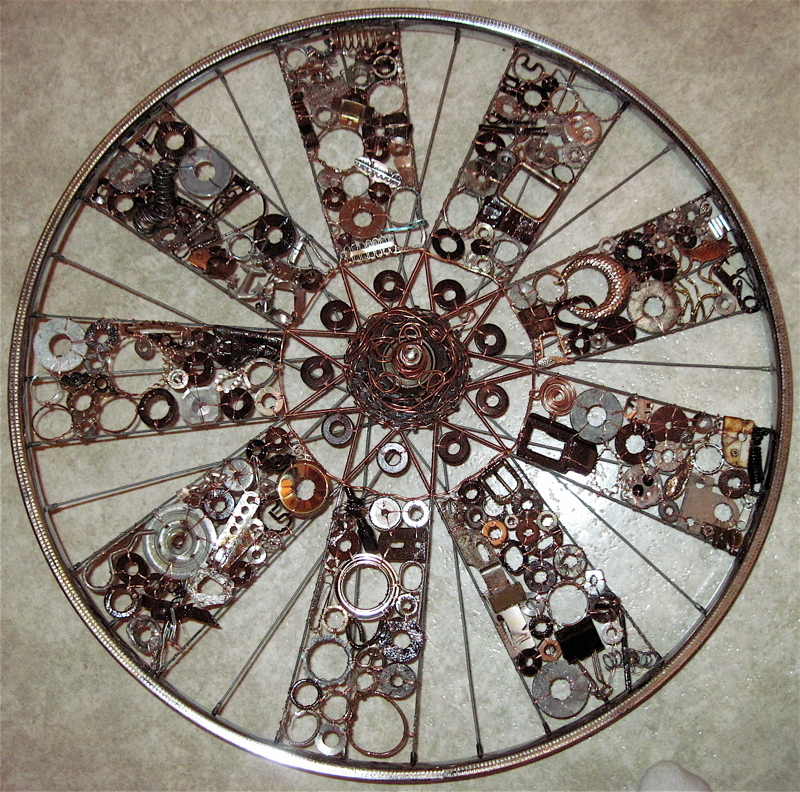 I will spare you the individual salvation stories of every piece of metal I incorporated into what I made of one of the bicycle wheels, the mandala “The Cycle of Life.” It is a tapestry of materials found on streets, parking lots, and sidewalks I and my friends have walked, from Louisiana, to Virginia, to Michigan, and places in-between, and also farther away, everything from rusty washers to broken jewelry to springs, and wings, hearts, and crosses. 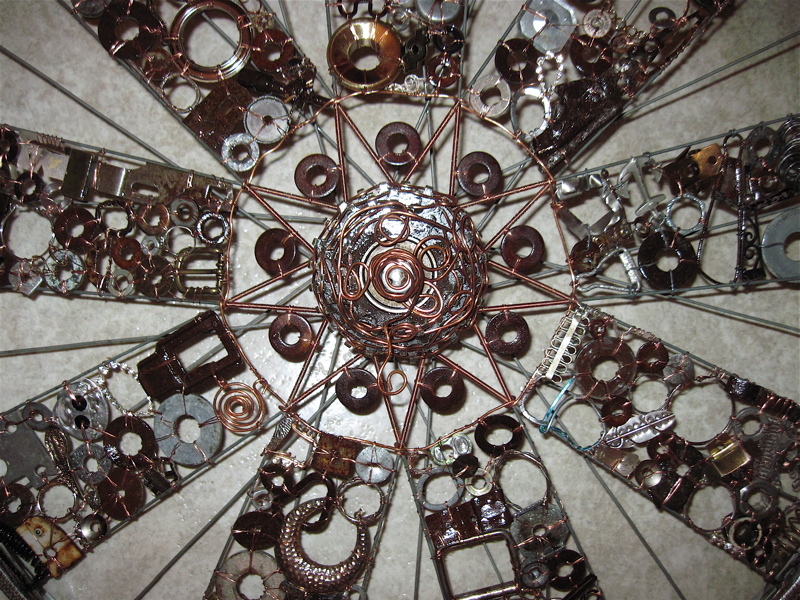 I also used about 250 feet of new 24 gauge copper wire to weave the whole thing together. The thing I love about old run-over, stepped on, rained on, broken, rusting metal, is that it is a manmade material in the process of being reclaimed by nature. I appreciate evidence of experience in people and in things. “The Cycle of Life” dignifies and coalesces the beauty of what was once thrown away. Now this was a surprise and not a surprise because although I wasn’t expecting him to say those words at that moment, I had sensed that he was warming up to saying them, especially when we were taking down the booth at the Flint Art Fair and in front of his sister, Janet, who was helping us, he called me his ex-wife’s name. I knew he’d been thinking of me in a husband-like way for awhile. But still, I was expecting him to ask me for gelato right at that moment, so his question did open my eyes a little. And then, although I had entertained fantasies of making him wait, say 24 hours, or 3 days, or a week for my answer, I could only say Yes! and right away. Steve has asked that question before in his life; I’ve said Yes to that question before in my life. And yet both of us, in our somewhat chastened, more experienced 50s, have not given up on the possibility of enjoying a loving living lasting harmony in marriage. We have learned things in our lives, about what is important and what is not important, and we have had some rough edges rubbed off. Nature–my own nature– is reclaiming me with serenity and felicity. on a sprig of thorn and never wither. These words encouraged me through some dark times, to not stop believing in the renewal of life, or of the seasons through which we pass in our lives. For winter is essential to the spring that follows. I can see that now.